The Kia Sportage won the title of ‘Best Crossover' at the 2011 Fleet News Awards held at an awards ceremony at the Grosvenor House Hotel in London last night. 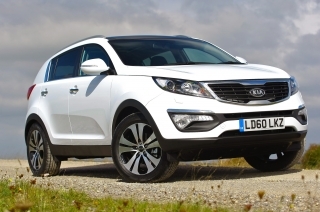 Commenting on their decision to give the ‘Best Crossover' award, in its inaugural year, to the Sportage, Stephen Briers, Editor of Fleet News said: "The Sportage is an indication of how far Kia has moved on in recent years. The Sportage looks desirable, is good to drive and is highly competitive on running costs, giving it strong appeal for drivers and fleets. Its efficient diesel engines also offer low CO2 emissions, making the Sportage a worthy winner of our ‘Best Crossover' title." Sportage won the award by fending off competition from the Nissan Qashqai, Skoda Yeti, Nissan Juke and the MINI Countryman. John Hargreaves, Head of Fleet and Remarketing, Kia Motors (UK) Limited said: "Sportage has already been an enormous success for us, allowing us to attract many new fleet buyers to the brand and we're delighted that Fleet News has recognised Sportage's strengths by awarding it the ‘Best Crossover' title. With very strong new products coming this year in the competitive B- and D-segments, we're confident that we will continue to add to our fleet customer base in the coming months." Sportage is available with CO2 emission levels as low as 135g/km and with the choice of 1.6 or 2.0 litre petrol engines and 1.7 or 2.0 litre diesel units. Two wheel drive and four wheel drive alternatives allow customers to select the best alternative for their particular needs and prices range from £17,015 to £26,740. All Sportages come with Kia's comprehensive and completely transferable seven year warranty.